Here, you will find a list of our personnel most directly relevant to your needs as faculty. Please don't hesitate to contact any of us; we are all happy to help you with anything that you may need to help our students succeed! Currently responsible for compiling all information relevant to textbooks in the AACC Bookstore, Keith is your first contact when your question pertains to the textbook cycle - from the textbook adoption process to student buybacks - or if you simply need information regarding a textbook. Questions regarding credit course materials should be directed to Keith. 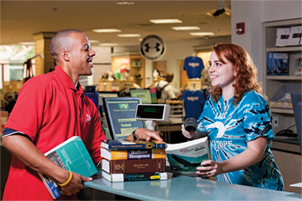 Responsible for helping to compile information relevant to textbooks in the AACC Bookstore, Mariana assists Keith with your questions pertaining to the textbook cycle - from the textbook adoption process to student buybacks - or if you simply need information regarding a textbook. Questions regarding noncredit course materials should be directed to Mariana. Responsible for faculty desk copies, inter-deparment charges, commencement regalia, and general customer service, Wanda is your first contact for inquiries of a customer service nature. Responsible for purchasing all general merchandise and tradebooks, C is your primary contact concerning required and / or recommended supplies for your courses. Responsible for creation and maintenance of photo identification badges for students participating in clinical or other special instructional programs as well as maintenance and support for the AACC Bookstore Web site. Also, your contact for AACC Bookstore Gift Cards purchased via interdepartmental transfer.